This might be one of my favorite projects. It costs almost nothing, took only one afternoon to put together and made more space in our little backyard for running around. I'm a sucker for vertical gardens-see my vertical herb garden and farmer's market inspired stand projects as proof - but this was way easier and has a little quirk to it too. If recall my Italian themed Christmas party a few years ago, you know I'm a fan of the beautiful design on the Scalino tomato cans. I just hate throwing them away so giving them new life as planters was a win. What goes better with tomatos than basil? 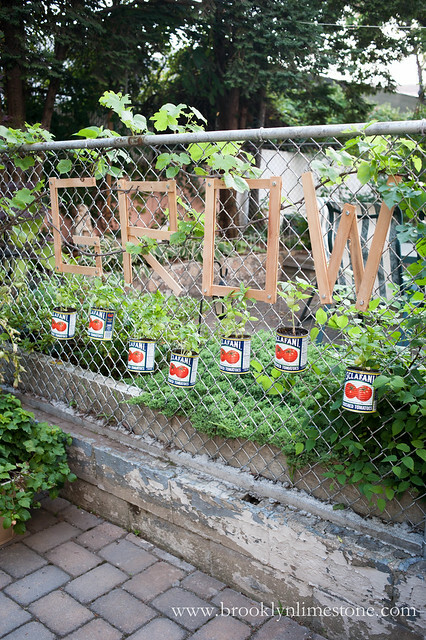 The "GROW" sign was an incantation for my garden to keep thriving despite a black thumb as well as a fun way to hide the ugly chain link. Made with cedar shims and bolts, I think I could use a few more planters to fill out the look but its a start. So what do you think? Anything I could add or should I just let nature take over? 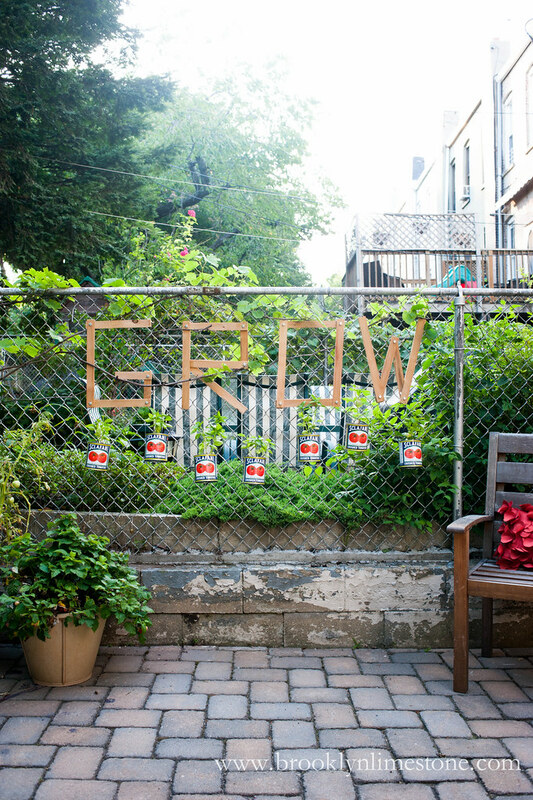 Do you have your own vertical gardening tricks to share? This is super cute!! We use basil a lot in the summer and I can't get enough of the smell! 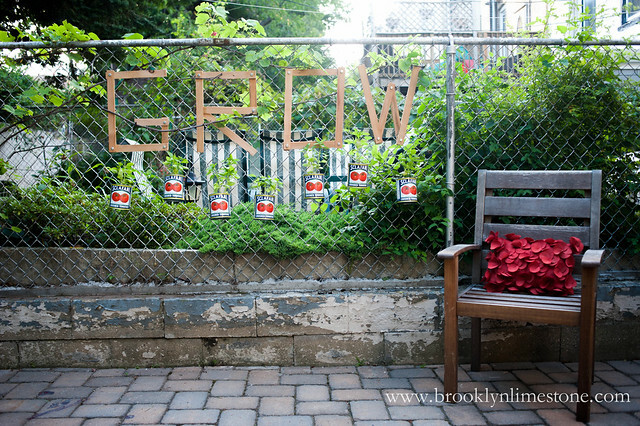 This would also be cute if you did a couple vining annuals in the a couple cans and train them around the "Grow" letters. Or if you painted the letters black or white and roughed up the paint to give it a vintage look to go with the cans. So many ideas could branch off of this! I'm actually growing a grape vine out of a pot on the fence as well so its sort of weaving its way around. I don't expect this GROW sign to make it for too many seasons since its just shims. If I had known I was going to like it so much, I would have bought some sturdier wood but I could always remake it with scraps down the road. Such a fun idea! 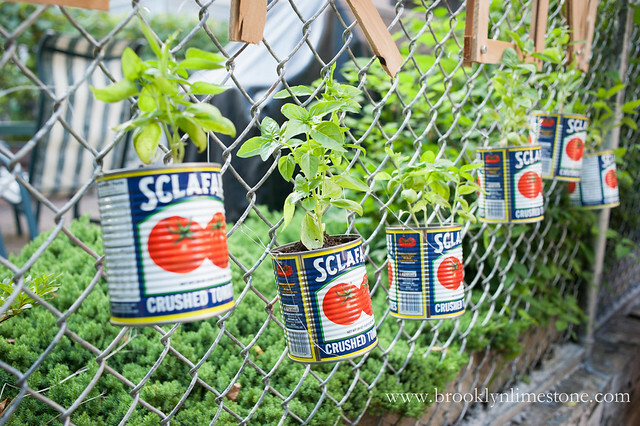 I wonder if the metal cans will get very hot in the sun, and since they dont breathe like terra cotta, if the basil will be happy? If you love basil like I do, you will have harvested it long before the metal becomes an issue! Good point..no clue if a hot can would bother the plant. I would imagine the heat would be dissipated by the dirt/water in the can but I could be wrong. I'll have to see how it goes I guess. Basil tends to be pretty hearty but I'm a pretty serious plant killer. I love this! I really love the labels on the cans too - you are so creative. 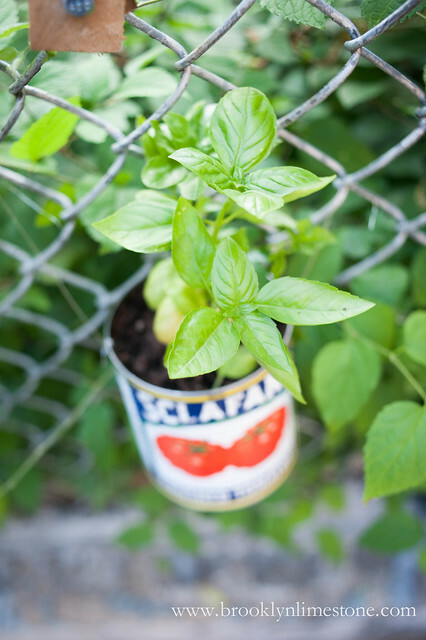 I plant in metal a lot - my herb garden is almost all planted in recycled galvanized metal containers. I also live in the upper south with really hot summer temps. I do think you need to watch what kind of things you plant in metal but as long as you keep it watered most herbs grow well in it. I think you'll have to watch it closely more because of the size of the cans than they are metal. They'll dry out much faster because they're small & elevated. I can never grow enough basil. As I think my containers I plant the extras in spots in my flower beds to have more. I wish you were my neighbor (for many reasons) and took tons of pity on me and just decorated and made everything pretty...this is so dam cute. So cute and clever! How did you attach the cans to the fence? Thanks Sarah. I used some floral wire b/c it's what I had laying around but any wire or twine would work. 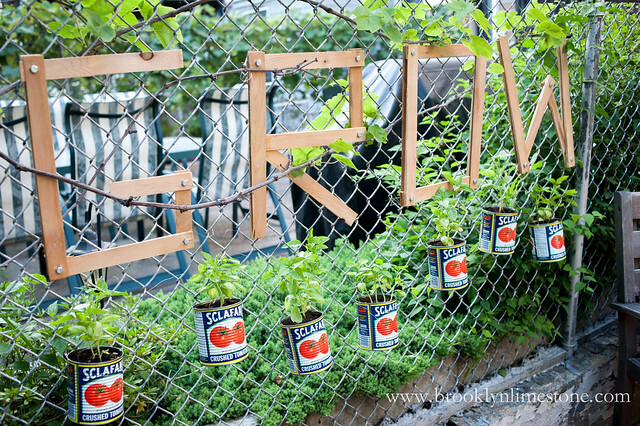 Such a clever and inexpensive way to jazz up a boring ol' chain link fence. High five for this one! Looks fab, S! Love those cans and the letters are so fun! Way to take advantage of a chain link fence! !